When landed at the center, we were welcomed by the spectacular display of the works of the sixty children, 30 each from age groups 8-12 and 13-16. 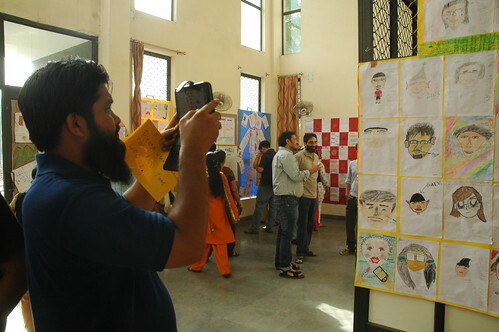 The works included caricatures with descriptions on different topics – My room, Most precious part of my body and why, My family and also their expression of feelings in words in the form of a letter to parents about why they are the best parents, how they feel towards parents response to their behaviour and outlook in life and so on. I cannot express the feelings every parent went through, looking at each of the letters. Many parents were feeling very emotional going through the pictorial descriptions and also the letters written by the elder children to them. They were surprised at the eloquence with which each child shared their inner feelings towards their parents. As the letters did not reveal who is the writer, parents were guessing which letter is of their child, reading through the narration of an incident which they were part of. In the process, almost every parent read every letter. Every parent was touched going through each of the letters. These letters threw a lot questions about the struggles of a child in the adolescent age and what they are expecting from their parents. It was a great way to bring the parents in touch with themselves and the impact of their actions on the psyche of the children. Here are a few of the expressions..
Once warmed up and familiarizing oneself, we moved to the next phase of the day plan. Every child had made an invitation card that parents carried. So my invitation card made by Mallika had a pattern cut, and one of the children in their group had the pattern. Once you match the pattern, the child who had my pattern, Sheena in my case, became my facilitator for the day. Two to three families with their facilitators formed a group. We had to interact and get to know about each other families. We were asked to close our eyes and my facilitator, Sheena, lead me along a path that was jig-jag to a destination. The exercise was about trusting one another and I felt really happy that I surrendered myself to Sheena and she lead me wonderfully. Finally at the destination she asked me to sit and after a while lie down and relax. While relaxing there were tender hands that was massaging my legs and arms and I could make out that it was Sheena. After a while a strong hand came and massaged, this could only be one of the adult trainers of NSD. Then finally there was another pair of hands that went all over the body, straddling, across while massaging and I could sense that this has to be very familiar person who has known me ever, that is Mallika. After half an hour of this relaxation exercise, I was ushered by Sheena to another destination with my eyes shut all the while. She helped me settle in one corner against the wall. I could hear and feel that others are being brought in to this room and helped to settle too. Finally we were allowed to open our eyes. The room was full of parents, forming the outer ring along the wall and the children were sitting in the center of this ring. Parents shared their feelings about the whole day thus far. Many were obviously moved by what they read on the display and the tender massages they received. They were emotional and shared how this workshop has thrown open new dimensions to their relationship with their children. After the feedback and sharings, we moved to the final stretch of the day. The groups thus formed, seven in all, each were given a situation to enact. The condition was that the adults have to be children and children were to be adults. The groups were given about 15 minutes to plan out before all assemble in the same room. A performing arena was demarcated and all groups settled in the audience spaces. Each group was called to perform. The scenarios included.. It was fun as well as learning experience interacting with other families and planning the skit. Many of the women and including a few men, were participating in such an exercise for the first time. It was a great experience for them also to open up and come out of the cocoon. On the other hand there were a few who were very uninhibited and were in acting with felicity. Each episode was enacted and then all participants discussed the issues – as how do we make the environment better for the children at home. The process did throw quite a few thoughts and many parents took away new ways of dealing with situations and their children. It also made many parents aware of their responsibilities towards their growing children and how they can go about investing. 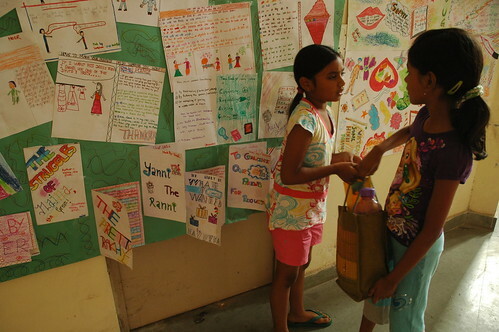 I came back and sat next to Mallika, after our group enacted the scenario – children getting spoiled. She was staring at me. I asked what was the matter. She immediately said, “you are a bad boy, you are spoiling others.” I could see that she did not expect me to portray such a character and does not approve of my dalliances. Nandu said that I was very funny..
With this exercise, the parents’ day came to an end. All parents were delighted to be there. I am sure the day would have thrown a lot of questions to each parent to ponder about and respond in a better way to children. This one month NSD’s theatre workshop would make a world of good for every selected child, Since this workshop is all about helping children to come in touch with their inner journey and external journey, with oneself and their behavioural patterns, with their securities and insecurities. Long live NSD, Long live TIE – Theatre in Education. Kudos to NSD’s facilitators. Kudos to children. 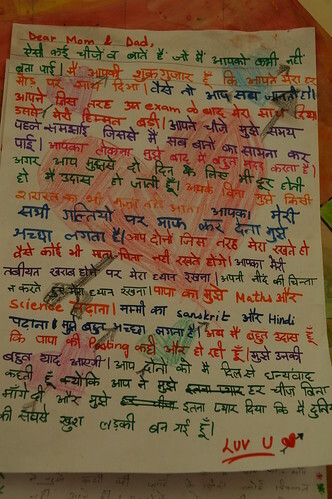 It was truly a ‘rangtoli’ of reflections on human emotions and aspirations. One month old Mallika…. Mallika’s Journey, a photo by Vasu.. on Flickr. Geetu- “Vasan , I almost forgot abt the grief I gave my parents”. This interaction made me write this piece. Thanks Geetu. Indira, Mallika and I are waiting the arrival of our new family member any time. I have been completely grounded. It has been a fortnight since. I have been working from home mostly, in anticipation of the arrival. 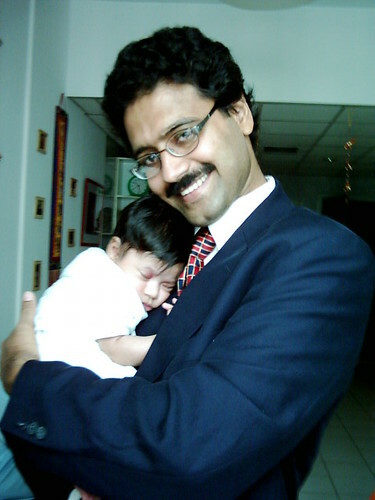 As we have been waiting for our second child, I was reminiscing the last eight years of journey with Mallika. What a journey has it be along with Indira. It has been no less than a rebirth. I loved every moment. Indira, I am sure, enjoyed more than me for she has always been there for and with Mallika. My forced break from hectic activities has proved to be invaluable in enriching family bonding – with a couple of false alarms on Indira’s front to helping Mallika find her feet in the real world. The fortnight has been very action packed and very significant in Mallika’s life too. For Mallika, we were keen to find a school that is in sync with our value system, yet that would help her blossom as good a human being while stoking her creative self. One such school we identified was Sardar Patel Vidyalaya (SPV). As the luck would have it, suddenly SPV opened admissions in the middle of the year for classes 1-3 and invited us also to fill the form. Mallika was not so keen initially. She really enjoyed going to her current school, Billabong high, as she loved her friends. Indira was instrumental in softening Mallika by taking her to a couple of events at SPV. Mallika started liking SPV as a result, though still ambivalent. Slowly we convinced her to take a shot at it. We filled the form and SPV took all the aspirants through the process of written exam. This was her first face-off with the real world, with about a 100 aspirants for 25 seats. After her written test, Mallika was a little disappointed as she herself felt, she could have done much better. She performed below her potential. But when the results of written exam was announced, Mallika made it to the shortlist of 40. It was a good boost to her confidence. She then jumped into it headlong. Then the face2face interaction followed. Finally, we found Mallika in the selected list. She found a good school for herself and hope it will turn out to be a great one. While the school admission process was on, we came across an advertisement about the selection process for summer theatre camp of National school of Drama. We went ahead and brought two forms, one for Mallika and another for her loving cousin Anandita. We applied keenly for both, though we were not sure whether Anandita will be able participate in the month-long programme. An audition was conducted for all the applicants and results were announced. Anandita made it to the final selected list, but Mallika was wait-listed. Mallika was really dejected. Since Anandita made it and she could not, it was all the more hurting her. She came back home and started painting with purposefulness. Indira and I were discussing, that perhaps it was the best result that could have happened, as Mallika was taking things for granted – parents exposing her to too many avenues!! This is a great lesson for her to reflect upon and take corrective measures. I went for the inaugural session of the summer workshop to see the possibility if any of the selected candidates do not turn up. It may give an opportunity for Mallika to squeeze in. Yes, indeed two of the selected candidates did not make it, and Mallika was the third in the waiting list. It is still a touch and go affair. NSD called us to be there in the evening to take stock and announce the status of the wait-listed. Mallika was sitting beside me waiting for the status, praying with folded hands and closed eyes. I have never seen Mallika so eager. So desperate to have it. She wants to be in the workshop along with her loving cousin Anandita very badly. As luck would have it, again she just managed to make it as the last selected candidate… Her joy knew no bounds. In a matter of a week, she grabbed two trophies – School and NSD theatre workshop. The journey of these eight years have been very very enriching. Got a great deal of opportunities to explore, experiment, experience and enliven our own lives. Music, dance, painting, photography, puppetry, poetry, story telling, unraveling science..traveling and living in country side, abroad… I recall every single moment with Mallika and Indira. My camera has been able to capture all these moments… What a journey it has been… The visual documentation is here for all to see..
Life and times of Mallika, a set on Flickr. I am eagerly looking forward to years and years ahead, with Mallika and the young one who is going to arrive this week. I want to see how Mallika bonds with the young one. It was here insistence to have a playmate, a sibling, that made Indira and me go for our second child. I am sure the journey ahead is going to be doubly enriching…. Welcome life….